The presence of a violin, if you call yourself a folk metal band, is nowadays not only a surprise, but almost a pre-requisite. But what if your band did not just have one violin, but a pair of them instead? Would that be a novelty? Maryland’s Isenmor provide an answer to these questions, showing that being dual-fronted by violins does not necessarily mean that you are turning the sound into a string quarter. 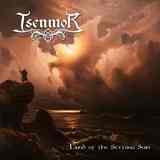 As Death is a Fine Companion, Pyre, and the title track on Land of the Setting Sun show, Isenmor know how to make those violins come through and take centerstage. While guitars forcefully chug (title track), and combine with bass and drums to provide punched up, but very mucky, bottom end (Death is a Fine Companion), violins manage to constantly weave (title track) and glide along putting out epic grieving melodies which are supposed to completely engulf the listener (Pyre). For me, I have to say the approach works. The whole impression ranges from melodic, yet rustically archaic, and Celtic tinged (Death is a Fine Companion), reminding of Eluveitie, early Tyr or Ensiferum, to something almost melodic death-like, akin to early In Flames when the latter had a folk element in their music on Lunar Strain and Subterranean. Just like with their front instruments, Isenmor doesn’t settle into a single vocal approach either. From gruff blackened vocals to clean crowd singing, the band is not committed or constrained by a single vocal style. When you need clean, they can deliver, but when emotions overwhelm, the rough vocals enter the fray (Pyre). Semi-balladic So Willingly Deceived and their version of the drinking song The Old Mead Hall show Isenmor’s range. In So Willingly Deceived piano and violin set up the picture of tragic fragile beauty, with clean hymnal singing floating above the churning riffing cauldron. The Old Mead Hall is pretty blistering in terms of speed, and is actually more combative than a similar song from Korpiklaani would be. Isenmor are more serious about their craft than tongue-in-cheek. A slightly different approach to a rather popular direction in metal earns more than a pass from Isenmor. Land of the Setting Sun is worth your attention, especially if you are a fan of the style.